I confess I’ve avoided writing about the families in this post for weeks. I doubt I’ll ever get to the point where photos like these don’t disturb me, but I will say there are fewer that shake me up inside – mostly because I know we’re doing something to help. This set of photos and stories, sent by our staff in Somaliland (northern Somalia), really affected me. 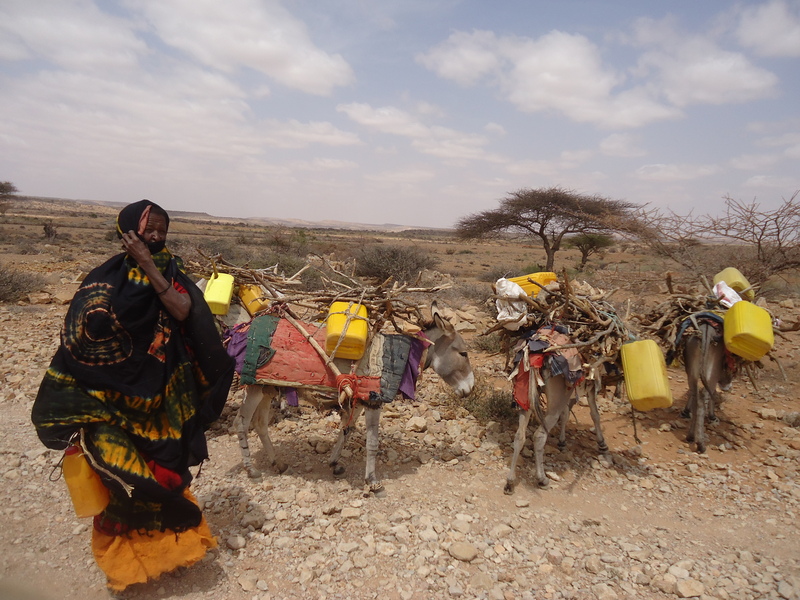 They were taken during an assessment of drought-affected communities to determine the needs of people there. One of World Concern’s priorities is to reach the most vulnerable first, so the families we help are often headed by females, have sick or disabled members, or are among the poorest of the poor; in this case, in the fifth poorest country in the world. These are some of the families we met. I wanted to share their stories and photos so that others know their circumstances. To give them a voice, in a way. Khadra feels she has no alternative than to tie her mentally ill husband to their hut. It took me a moment to figure out what was going on in this photo to the right. 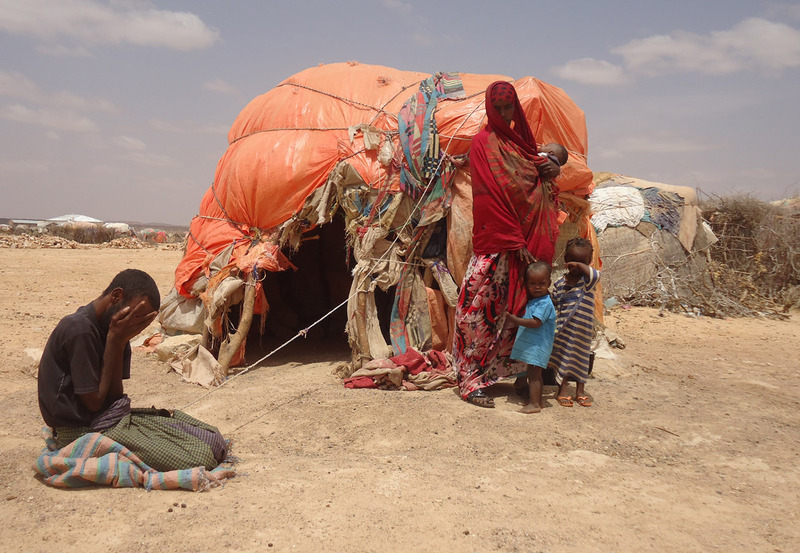 It shows Khadra, a young mother of three from the Sanaag region outside her small hut fashioned from sticks, plastic and pieces of fabric. The family had 200 sheep and goats before the drought. They lost them all. While talking with Khadra, our staff learned her husband is mentally ill, suffering from psychosis. 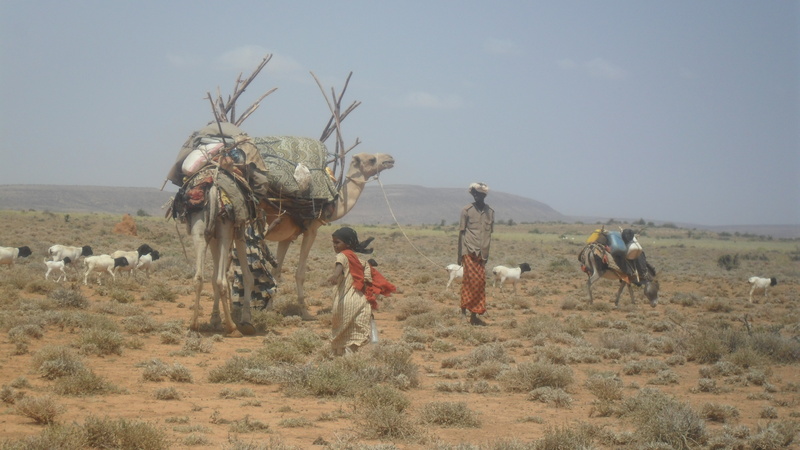 Khadra said that she feels she has no alternative other than to tie him to their hut so he won’t wander away. I can assure you, there aren’t any social services in this part of Somalia. Definitely no mental health counseling. Imagine being in Khadra’s position and not knowing what else to do. My heart aches for her. Salah is thin and ill with respiratory problems. 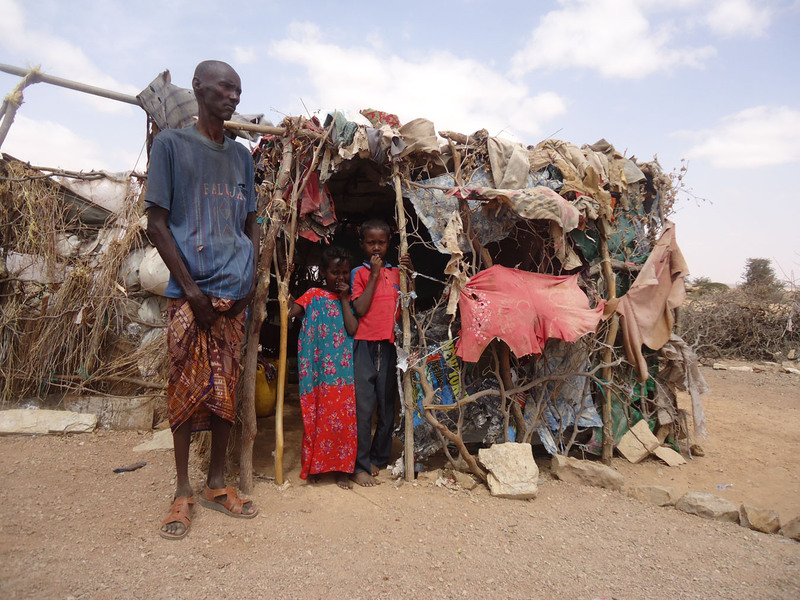 He and his children live in this makeshift home in a drought-affected region of Somaliland. The part of Salah’s family photo (left) that troubles me most is their home. You can see they’ve tried to use scraps of trash, or whatever they can find to create some sort of shelter, but it’s no match for the searing daytime sun or cold desert nights. I’m assuming this father has lost his wife. I’m told he has chronic respiratory problems and is very sick. He and his children survive off of food provided by neighbors and relatives. 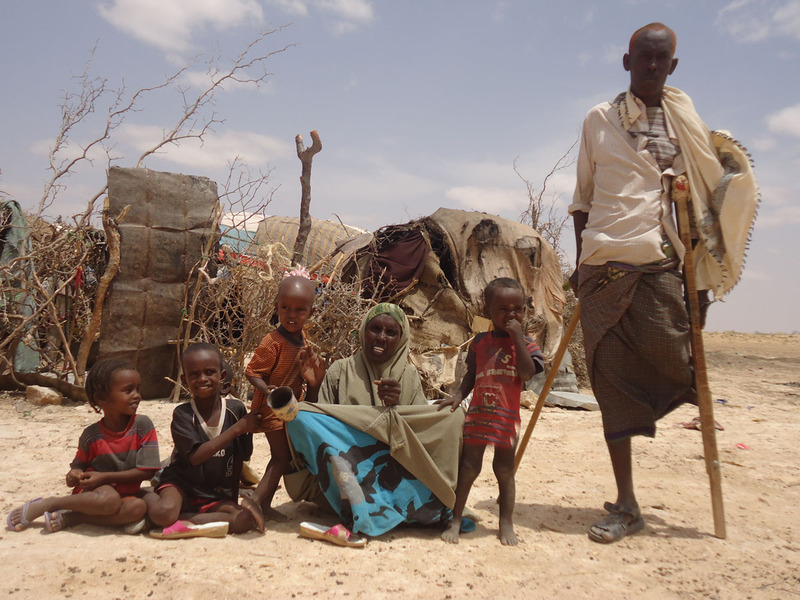 Arale (below, right) is a disabled father of four who migrated to Garadag after losing his herds to drought. Their only source of income is to send their children to look for animals owned by other families, for which the children earn a small daily wage. World Concern is helping these families, and thousands of others, initially by trucking water into drought-affected communities in this region and distributing emergency food. Families also receive plastic tarps for shelter, jerrycans, mosquito nets and cooking pots. Arale's children earn money for food by rounding up other people's animals. Long-term, we’re building berkads (semi-underground water reservoirs) and digging new wells – 36 of them in the coming months! Another way we’re helping is providing people with the tools and knowledge to grow vegetables and improve nutrition through kitchen gardens. There is hope for these families. Somaliland is slightly more politically stable and has experienced more peace than the rest of Somalia, having declared its independence in 1991. This is one reason we’ve been able to make progress there. Time is another factor. We’ve worked there for 30 years, enabling us to respond quickly when disasters like drought, war or famine strike. We’re hoping to reach more families like these throughout Somalia.